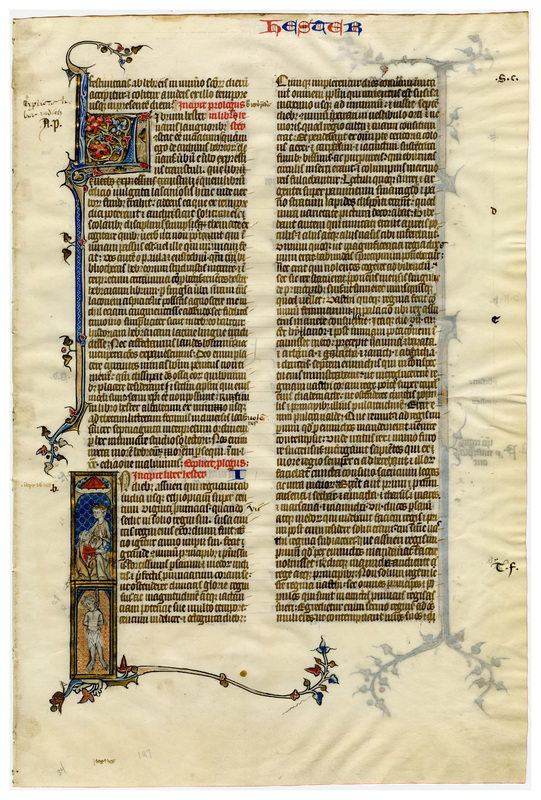 This copy of the Latin version by St. Jerome was made during the period when France stood at the height of her medieval glory. A decade or two before, Louis IX (Saint Louis), the strongest monarch of his age, had made France the mightiest power in Europe. This favorable political situation rendered possible the "golden age" of the manuscript, and Paris became the center in which the finest manuscripts were written and sold. In the quarter century from 1275 to 1300, marked advances were effected in the art. The bar borders came to be executed in rich opaque gouache pigments, with ultramarine made of powdered lapis lazuli predominating. The foliage scroll work inside the initial frame created a style that persisted with little or no change for nearly two hundred years. The script was well executed and was without rigidity or tension. All these elements, together with the sparkle which was created by the casual distribution of the burnished gold accents, give to this leaf a striking atmosphere of joyous freedom. The vellum is thin, white, and supple, with minimal yellowing. Lining is done in light ink or lead. The bulk of the text is in brown ink, with red, blue, coral, white, and beige for the decorations. This leaf is heavily illuminated and decorated, including scenes from the book of Esther, elaborate initials and foliage, highlighted book names and chapter numbers, and extensive use of gold leaf. While the decoration is exceptional, we can see an unusual number of scribal corrections (especially erasures and strikethroughs). Text: Judith 16:31; Jerome's prologue to Esther; Esther 1:1-17 (recto); Esther 1:17-2:19 (verso). The translation of the prologue to Esther is by Kevin P. Edgecomb. ...the festivity of this victory is received by the Hebrews in the number of holy days, and is religiously observed by the Jews from that time until this day. Here begins the prologue of the blessed Presbyter Jerome to the book of Esther. Here ends the prologue. Here begins the book of Esther. ...will say: King Assuerus commanded that queen Vasthi should come in to him, and she would not. 18 And by this example all the wives of the princes of the Persians and the Medes will slight the commandments of their husbands: wherefore the king's indignation is just. 19 If it please thee, let an edict go out from thy presence, and let it be written according to the law of the Persians and of the Medes, which must not be altered, that Vasthi come in no more to the king, but another, that is better than her, be made queen in her place. 20 And let this be published through all the provinces of thy empire, (which is very wide,) and let all wives, as well of the greater as of the lesser, give honour to their husbands. 21 His counsel pleased the king, and the princes: and the king did according to the counsel of Mamuchan. 22 And he sent letters to all the provinces of his kingdom, as every nation could hear and read, in divers languages and characters, that the husbands should be rulers and masters in their houses: and that this should be published to every people. festivitátis ab Hebrǽis in número sanctórum diérum accípitur, et cólitur a Judǽis ex illo témpore usque in præséntem diem. Incipit prologus (beati Ieromi presbyteri) in libro Hester. Librum Hester variis translatoribus constat esse vitiatum. Quem ego de archivis Hebraeorum elevans verbum e verbo pressius transtuli. Quem librum editio vulgata laciniosis hinc inde verborum funibus trahit, addens ea quae ex tempore dici poterant et audiri, sicut solitum est scolaribus disciplinis sumpto themate excogitare, quibus verbis uti potuit qui iniuriam passus est vel ille qui iniuriam fecit. Vos autem, o Paula et Eustochium, quoniam et bibliothecas Hebraeorum studuistis intrare et interpretum certamina conprobastis, tenentes Hester hebraicum librum, per singula verba nostram translalionem aspicite, ut possitis agnoscere me nihil etiam augmentasse addendo, sed fideli testimonio simpliciter, sicut in hebraeo habetur, historiam hebraicam latinae linguae tradidisse. Nec affectamur laudes hominum nec vituperationes expavescimus. Deo enim placere curantes minas hominum penitus non timemus,quoniam dissipat Deus ossa eorum qui hominibus placere desiderant et secundum Apostolum qui huiusmodi sunt servi Christi esse non possunt. Explicit prologus. Incipit liber Hester. 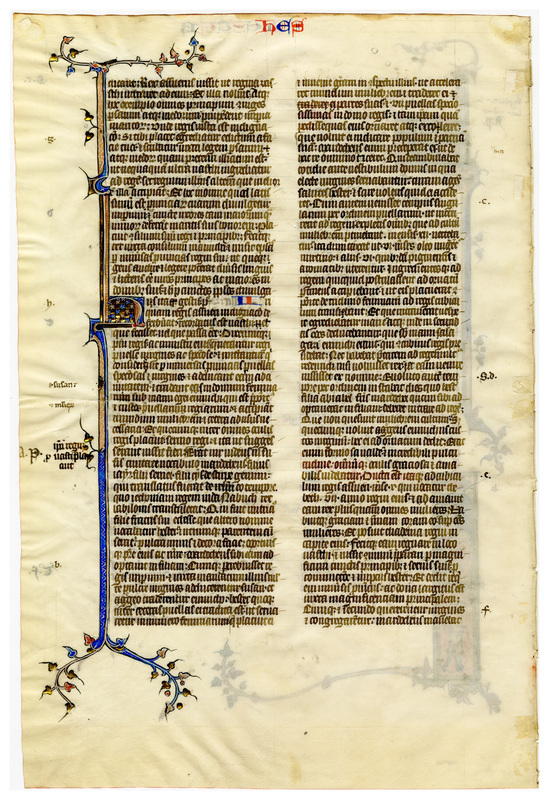 “E0014 Leaf from a Bible (Biblia Sacra Latina, Versio Vulgata),” Digital Exhibits | Denison University Archives & Special Collections, accessed April 23, 2019, http://exhibits.denisonarchives.org/items/show/38.